When the precision machined components is completed from the machine processing,the surfaces are sticky cutting fluids,grease,dirt and other debris material.If the parts is required coating/plating,all parts in the ultrasonic cleaning done before plating.Some times the surface treatment is not required for some parts,we should do cleaning next step.Make sure the precision machined components to be clean and grease free. Due to get clean precision machined components,MEI Precision Manufacturing used automatic ultrasonic cleaning line,by the control device to automatically complete the product into the pool and each cleaning program. Ultrasonic cleaning machines using ultrasonic vibration principle, all kinds of complex shape, cleanliness requirements of high precision machined parts surface cleaning, to remove the part adhering oil, radioactive substances, dirt and other matter.As part of the optical parts, auto parts, electronic parts, medical equipment and other accessories required for high-precision. To avoid scratching the parts during cleaning, we design suitable rack for different parts.All parts need to clean after feeding the dryer for drying,so that it can ensure clean and dry. All the precision machined components apply to used in car industry,automotion equipment assembly,electronic industry,optical communication,medical equiipment,and many machinery industry areas. You know burr is the inevitable product of metal processing, it is difficult to completely avoid. Burr exists, not only affects the appearance of the product, but also affect product assembly, performance and life. With the development of high technology, improve product performance, product quality requirements more stringent, removing burrs of precision machined parts is more important. Ultrasonic cleaning can help us to remove small burr of the metal machined parts,when the ultrasonic abrasive suspension into the liquid, free abrasive obtained by ultrasonic impact energy on the workpiece surface is processed to obtain the desired size. When the free abrasive to high speed impact burr,it be removed from parts.Deburring ultrasonic power source is provided by ultrasonic means so little energy carried by the abrasive, so it can only remove tiny burrs. 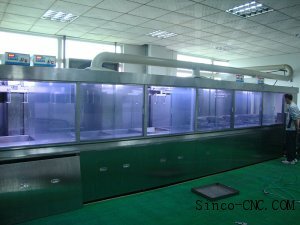 The advantages of auto-ultrasonic cleaning line. At MEI ,all precision machined component thru the ultrasonic cleaning before the shippment.